John Isner served a tournament-record 64 aces in winning the U.S. Clay Court Championships for the first time. HOUSTON (AP) -- John Isner beat Nicolas Almagro, 6-3, 7-5, in the final of the U.S. Men's Clay Court Championship on Sunday for his tournament title of the year and the sixth of his career. Isner had seven aces in the match, giving him a record 64 for the tournament. He broke the record of 60 set by Pete Sampras in 2002. Almagro leads the ATP Tour with 266 aces. He had five against Isner. Isner had aces of 144 and 142 mph in the 10th game to hold serve. "I've always known I could play well on clay," Isner said. "This week is surprising because the first ball I hit on clay since September was Monday when I arrived here from Idaho." The players were on serve in the second set until Almagro was broken in the 11th game. Isner then served for the match in the 12th game. He added his final ace, bringing the final to match point, and Almagro popped up Isner's final serve to end the match. Isner won $82,300 and Almagro earned $43,310. Isner is second on the ATP World Tour with 258 aces and he won 75 percent of his first serves against Almagro, who won 55 percent of his first serves and double faulted four times. "His serve was like normal and his serve today was tough for me," Almagro said. "I want to congratulate him because he's really good player and a good person and he did a good job this week and he won the tournament." Almagro broke Isner in the third game of the match. After that, Isner faced only one more break point in the match. Isner broke Almagro in the eighth game of the first set for a 5-3 lead. He hit a drop shot winner and slammed a forehand down the line at break point. Almagro played in his 19th career final. He has won 12 titles, all on clay. He dropped to a 17-7 match record on the year and has two semifinal appearances at Buenos Aires and Acapulco. Isner is the first American to appear in an ATP final this year. Isner lost to Juan Monaco, 6-2, 3-6, 6-3, in last year's final. "It suits me well," Isner said of the Houston courts. "The court is pretty slow, which I like, and the balls also pretty light. That's normally a good recipe for me." Almagro lost only one set in his drive to the finals with victories over Gael Monfils of France, seventh-seeded Paolo Lorenzi of Italy and wild card Rhyne Williams of the United States. Isner had a tougher time getting to the final match with three tie-break sets and three three-set matches in victories over Americans Ryan Harrison and Jack Sock, Lithuanian Ricardas Berankis and defending champion Juan Monaco of Argentina. 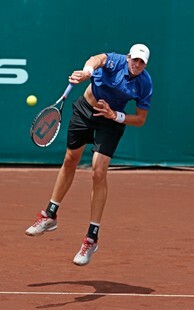 "I knew it would be a tough adjustment, but I knew I just had to find a way to get through my first match," Isner said. "I did and I got to my second match, which was really close. I really started to play better each and every round." Isner won twice last season, at Winston-Salem, N.C., and Newport, R.I.